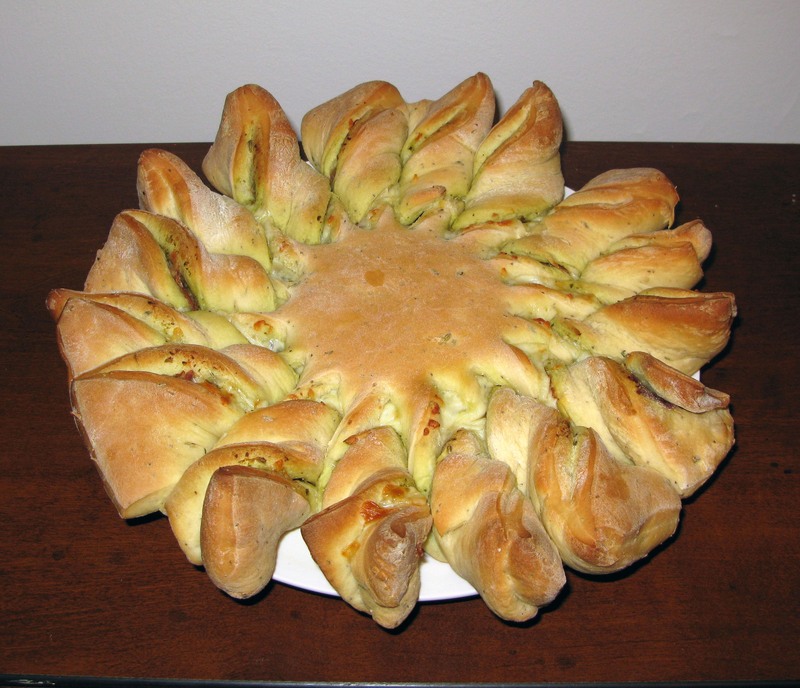 Pesto Pinwheel Bread | I Wanna Bake! I first saw a version of this bread on the Great British Baking Show, and I knew I had to try it. It’s simply too pretty not to make. However, being who I am (and knowing that my husband hates butternut squash), of course I had to make some revisions to the recipe. I decided to add some herbs and spices to the dough, and I went with an almost entirely different filling. What I ended up with turned out pretty much like inside-out pizza without sauce, but I’m ok with that because it was delicious. It tastes best warm out of the oven, but it also tastes good cold. I am in the process of experimenting with freezing and thawing it, so I will update you on how that works out. 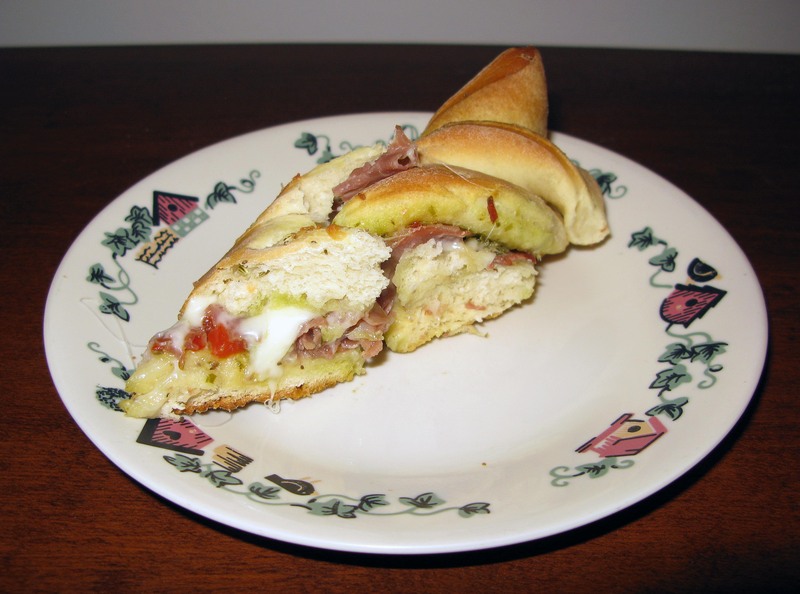 You have a lot of leeway when it comes to the filling ingredients and dough flavorings. Just try not to add anything too moist (I’m looking at you, tomatoes), as that will make the dough soggy on the inside, and may also release steam, which will mess with your baking. 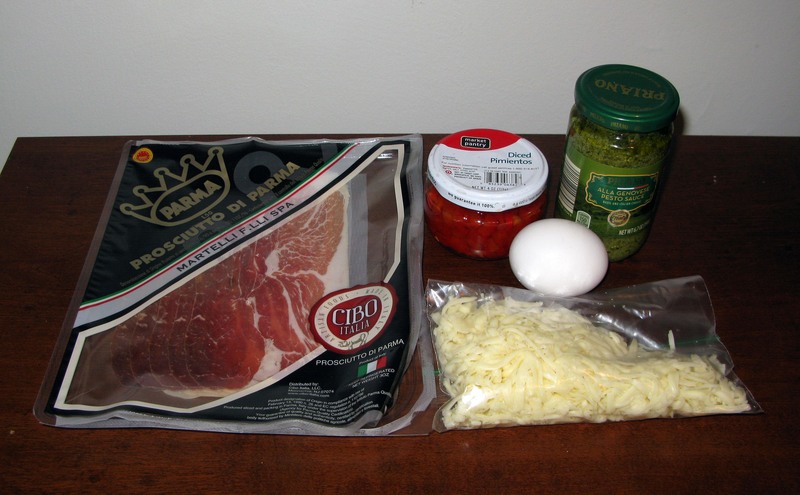 You can change the meat and cheese, add different herbs, try some vegetables, just about anything you want. Experiment away, and don’t forget to tell me all about it! If you want to shortcut this, you could probably use refrigerated pizza dough and no one would be the wiser. You won’t get much of a chance to change the dough’s flavor (and this is something I recommend doing), but it will significantly cut down on time and effort. This is something I never thought I’d find myself saying, but I’ve been in the mood for Fleetwood Mac lately. I blame the radio, which tends to play at least one of their songs each day. They’ve been through quite a few changes throughout their existence, so there’s bound to be something for everyone if you look in the right era. In a stand mixer bowl or other large mixing bowl, stir together the warm water and powdered sugar until the sugar is fully dissolved. 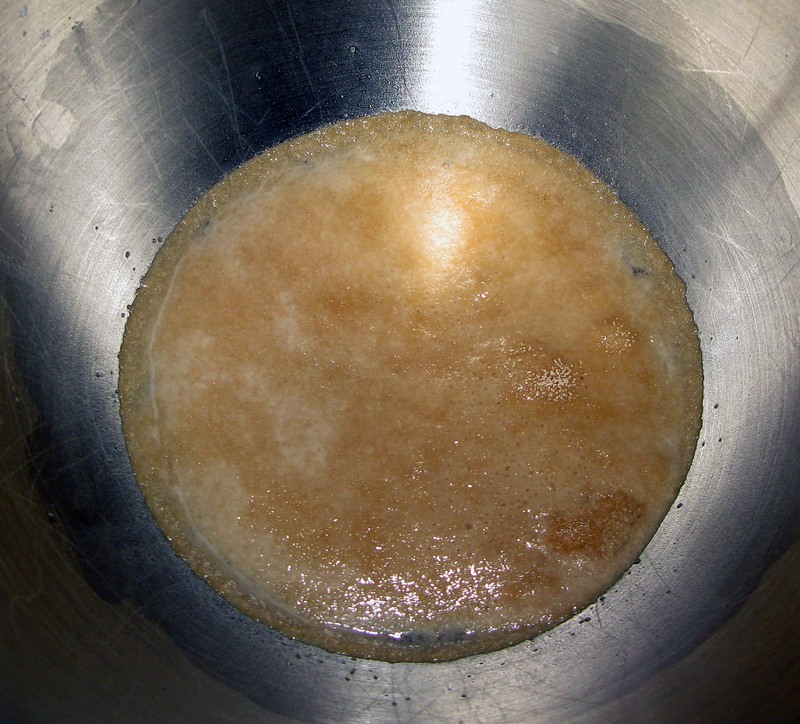 Sprinkle the yeast on top of the water at let sit for 5 minutes, or until the mixture looks foamy. 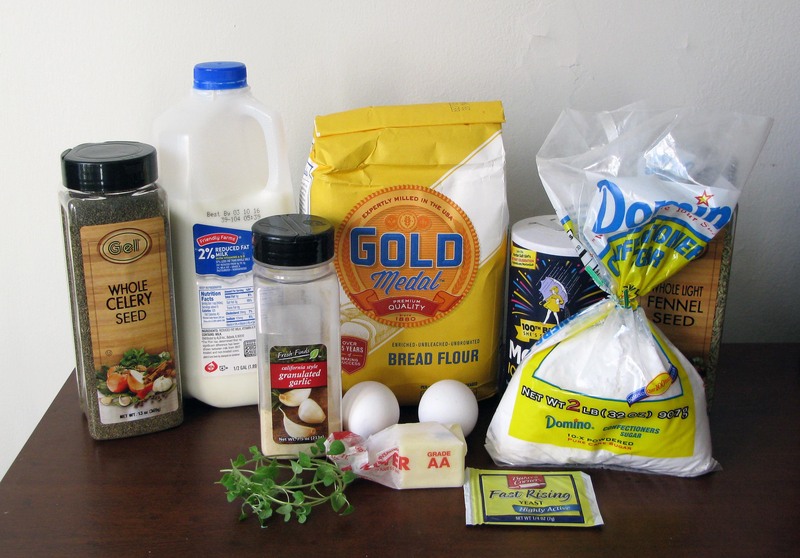 Stir in the melted butter, milk, eggs, flour, salt, fennel, celery seed, and oregano until a dough begins to hold together. If you are using a stand mixer, knead on low speed using the dough hook until the dough forms a smooth, elastic ball, about 5-7 minutes. If you are working by hand, knead the dough for about 10 minutes instead. 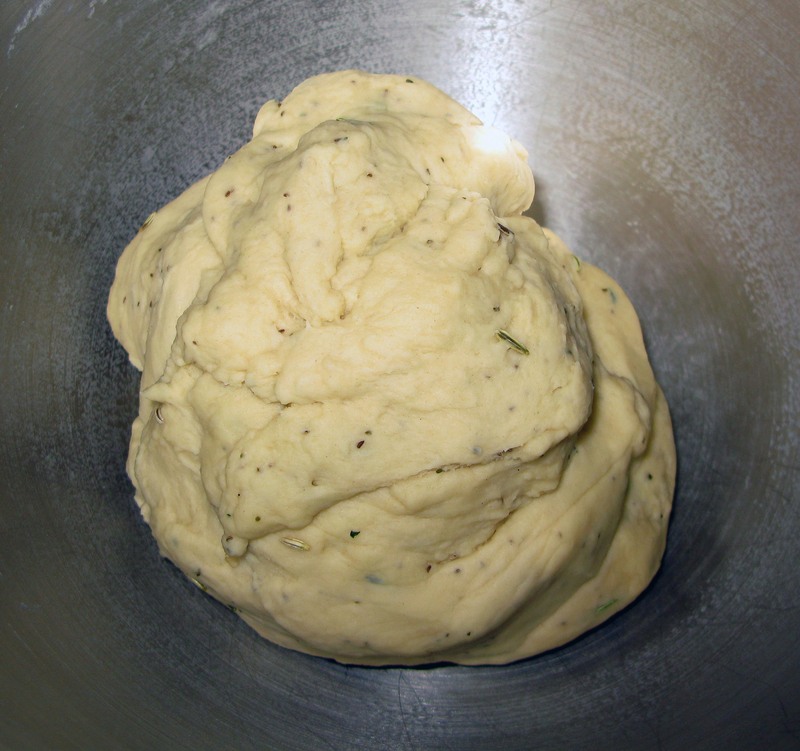 Put the dough ball into a greased bowl, turning it once to coat both sides in oil, and leave it in a warm place, covered, to rise for about one hour. When the dough has approximately doubled in size, punch it down. Cut the dough in half and return one half to the greased bowl. 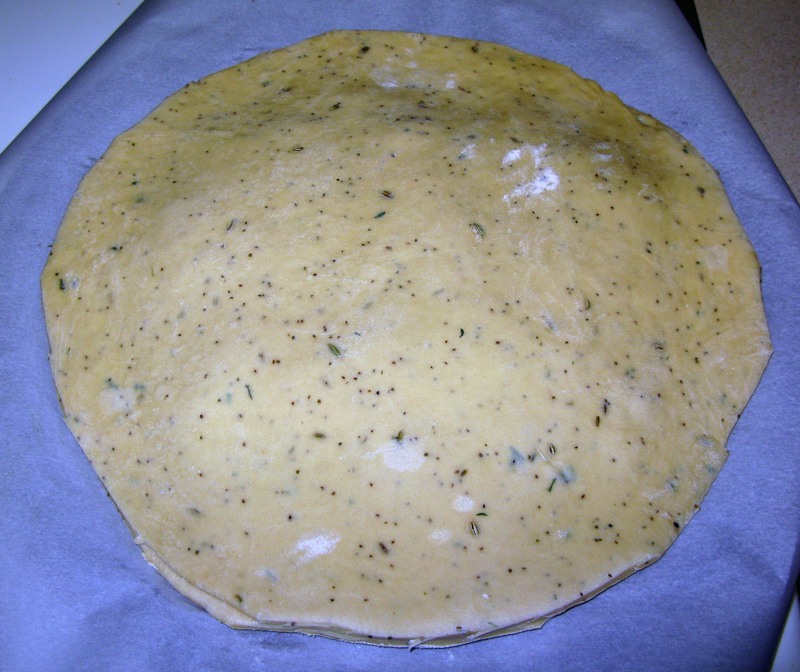 On a lightly-floured surface, roll out the remaining half of the dough into a circle roughly 12″ in diameter (I do realize that calling this shape a circle is a bit imaginative of me, but it works out in the end). 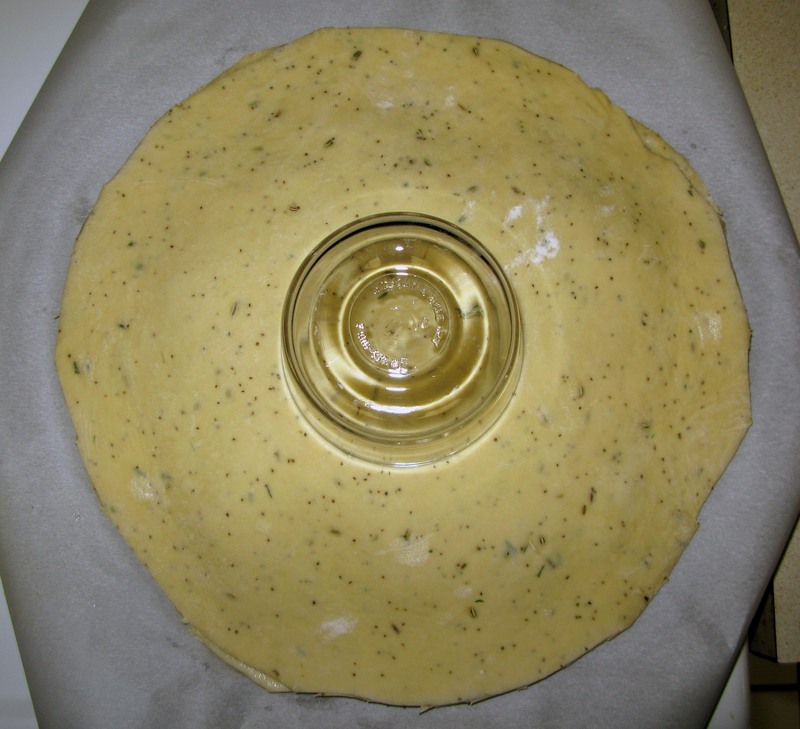 Let the dough circle rest for 5 minutes (it will shrink a little), then roll it out again, this time to a 13″ circle. [Mine didn’t shrink much at all, so don’t worry too much if yours doesn’t either.] 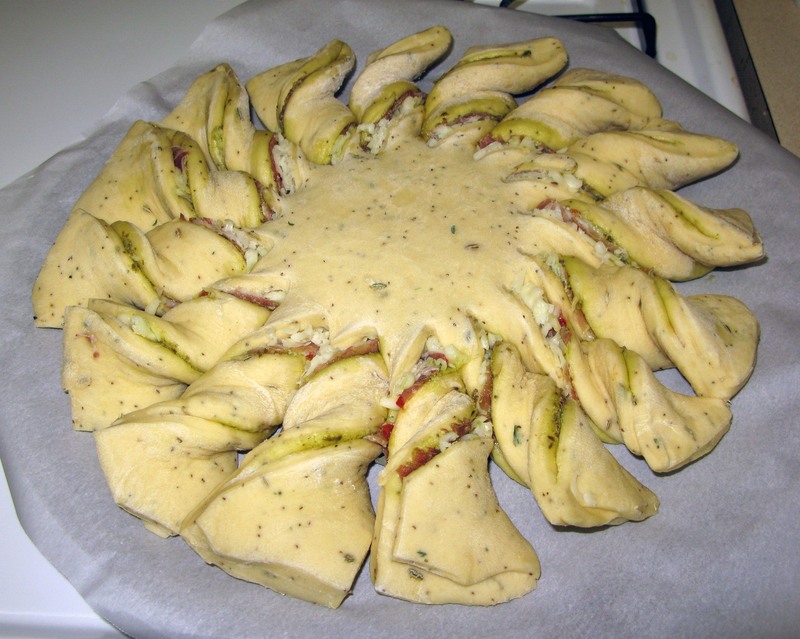 Carefully transfer the dough circle to a large cookie sheet or pizza pan lined with parchment paper. Repeat the process with the remaining dough. 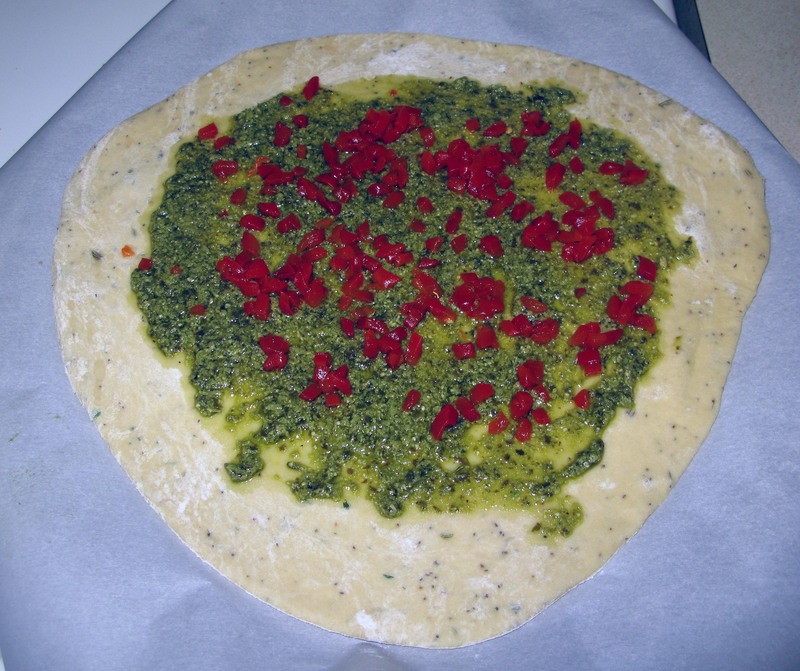 While you are waiting for the second dough circle to rest, spread the pesto evenly across the dough, leaving approximately a 1″ border around the edge. Sprinkle the pimentos on top. 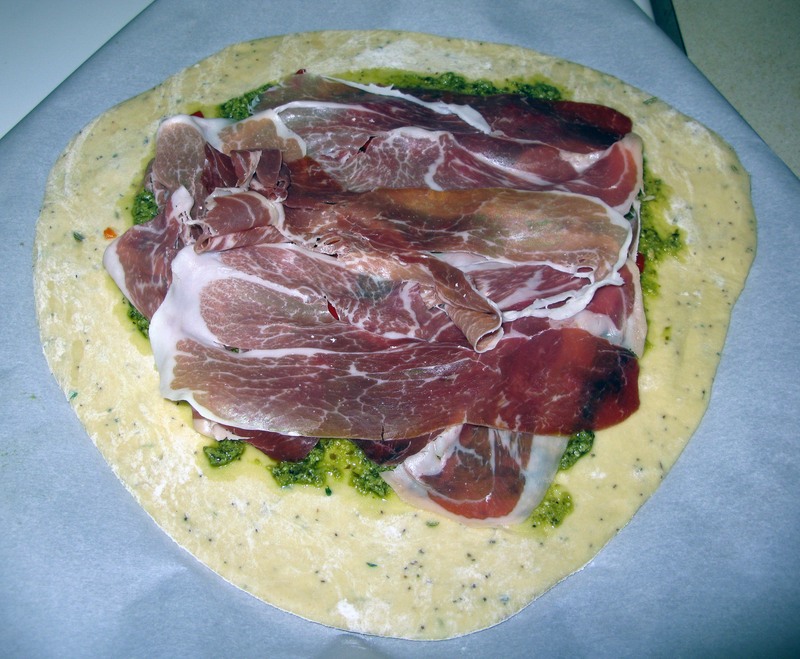 Lay the prosciutto slices on top of the pesto/pimento layer, overlapping as necessary, to completely cover it. 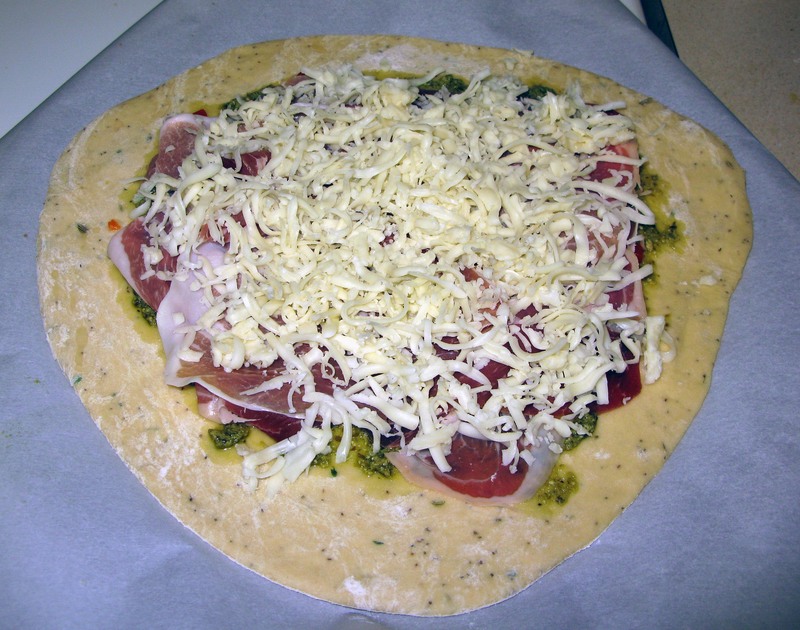 Sprinkle the mozzarella cheese on top of the prosciutto layer. By now, your second dough circle should be ready to re-roll. Do so, then lightly brush water around the edge of the bottom dough circle using a pastry brush or your fingers. Carefully center the second dough circle on top and press the edges together to seal the seam. 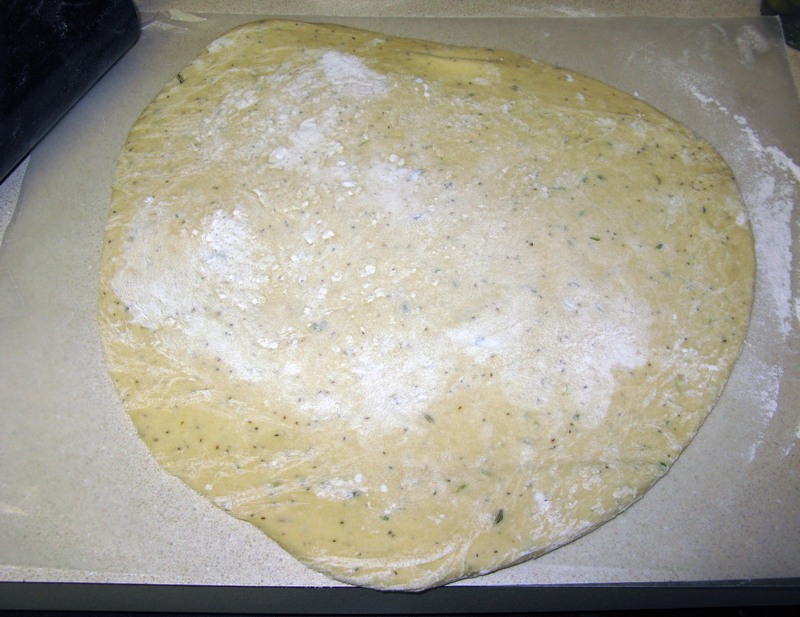 Trim the dough into a neater circle using kitchen scissors or a sharp knife. Place a small bowl or large glass in the center of the circle. 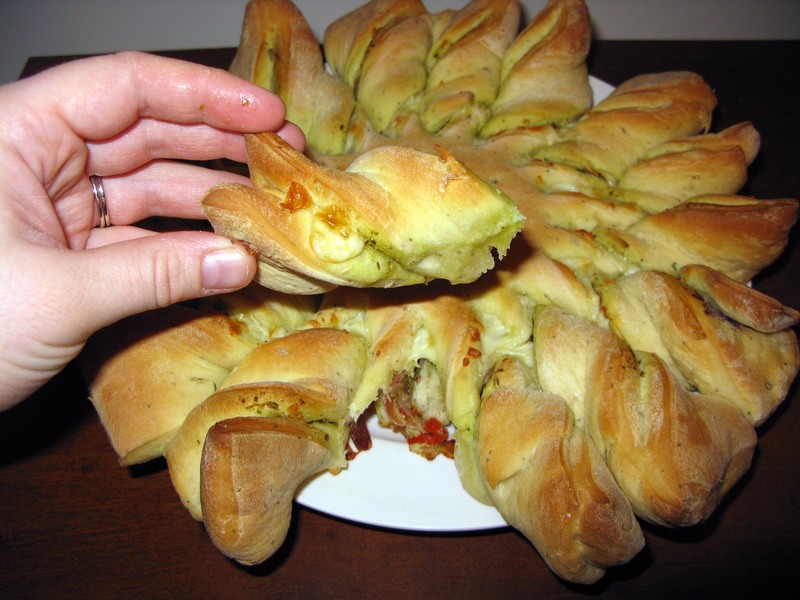 Again using your kitchen scissors or sharp knife, cut the dough into 16 strips from the edge to the bowl. I find it easiest to keep it even if you do this ¼ at a time (divide the first quarter of the dough in half, then divide each half in half again). Remove the bowl when you’re done. One at a time, carefully twist each strip of dough twice in the same direction and press them down onto the parchment paper. Cover the dough with a towel and leave to rise for 30 minutes (the difference won’t be particularly dramatic). I like to preheat my oven (to 375°F) during this time so the heat helps the dough to rise. If you haven’t already done so, preheat your oven to 375°F. Re-twist any dough strips which have started to unwind, then brush the top with the beaten egg (I forgot to do this and it turned out fine, but the top will look a little nicer if you remember this step). Bake the bread for 20-25 minutes, or until it is golden brown across the top. Check it after 15 minutes, and cover the twists in foil if they are already looking brown. Once the bread is done, allow it to cool for at least 30 minutes before serving. As you can see, the twists pull off easily. You can also slice the bread into wedges. If you expect it to all be eaten in one sitting, you could also top the middle with seasoned, diced tomatoes for added color and flavor (do not do this if you plan to save it, as the tomatoes will make the bread soggy). Otherwise, serve plain or with marinara, and don’t forget to refrigerate the leftovers.